Exotic Solution is ultimately designed to provide alternative methods of doing a lot of tasks. It firmly leaves the realm of real-world physics and goes well in to science fiction, but makes an attempt to maintain the physics-oriented gameplay inherent to KSP. The mod focuses around Exotic Materials and Exotic Energies. Exotic Materials have to be refined in a zero-g environment, but can then be utilized anywhere. Exotics Cores convert Exotic Materials into Exotic Energies, which then power the advanced technology. When a vessel is recovered with exotic materials/energies stored they are all converted into exotic materials and stored in the KSC and can be used to launch ships again. There is no buying/selling of exotic materials. 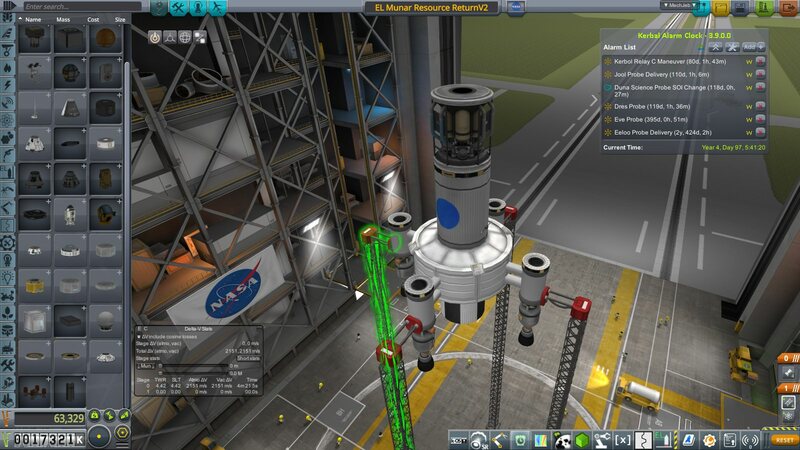 Exotic Solutions is 'Balanced' around extended techtrees and the inability to buy exotic materials at the KSC, they must be produced and landed back at the KSC. I strongly recommend installing an extended tech tree for use with ES. Currently, I'm building in support for CTT. I'll be happy to accept pull requests for other tech trees and may be willing implement support for some of them if I can easily find the information I need to do so. Exotics Cores: Convert Exotic Materials into Exotic Energies. Conversion is very slow, refilling an EE core takes a couple days. Only a single core can be active on a vessel at any time and all inactive cores convert their stores of EE back to EM slowly, but still faster than the generation rate. Exotic Variability Drives(EVEs): By default, these drives are slightly worse versions of drives available earlier on, however by expending exotic energy they can be given far more powerful thrust and ISP. Isp/thrust can be changed in flight, as it is increased the engine will consume progressively more EE. Gravitic Drive: Runs on EE & EC, produces negative gravitational mass which effectively lifts the craft away from it's SOI with force proportional to gravity. Not able to produce propulsion laterally. Refineries: Refine Exotic Materials. Must be refined in-orbit, exotic materials will not be able to be refined on the ground, they require zero-g environments for formation. Kinetic Shunts: Capable of locking on to surface of celestial bodies or other crafts. Transfers momentum between itself and locked on target. Allows for a wide variety of powerful maneuvers with fairly minimal weight, but requires something to transfer momentum to. Kinetic Catapults: Capable of locking onto two targets and transferring momentum between them. Capable of launching other objects without moving themselves. Energy shield: Serve as a craft-wide heat shield and air resistance to slow you down on re-entry. Also be able to soak collision and allow parts (solar panels, radiators, antenna) to ignore aerodynamic forces as long as the shield holds. Water collisions are real funny, and I may not be able to fix this. 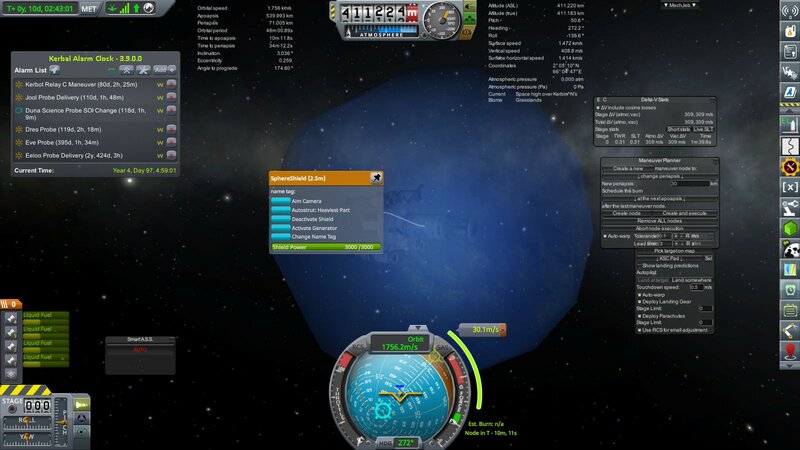 I may ultimately remove all of the collision soaking capabilities, resulting in these acting entirely as advanced craft-wide heat shields and to a limited extent parachutes due to the atmospheric slowing. Also, currently the only things that cost shield energy are atmospheric reentry heat and collision. I haven't been able to figure out how to figure out the aero forces that are being applied to a part to take that into account. Teleporter: Teleports stuff. 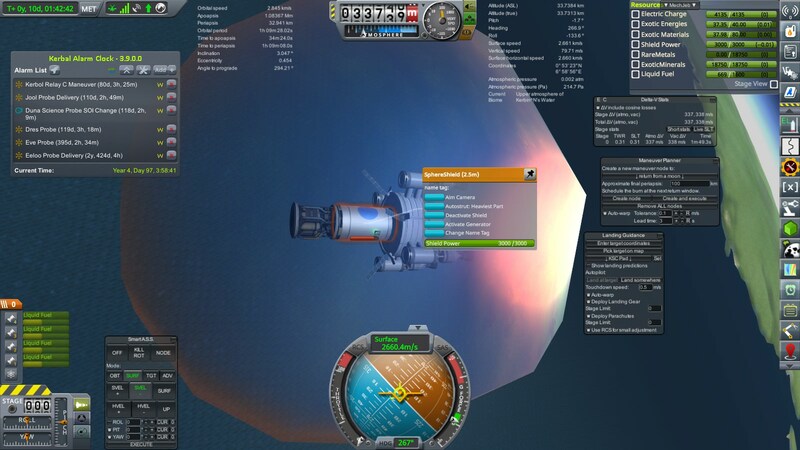 Ideally, should be capable of teleporting resources, kerbals, and ships. Requires velocity matching to teleport. Blink drive: Ship self-teleportation. Preserves momentum, but can instantly teleport several hundred kilometers. Precise distance transportation. Mass inversion generator and/or tank: Reduces it's mass and the mass of nearby parts. Increases delta-v, can substantially increase craft manueverability by doing things like placing it on a gimbling engine or other nearby heavy parts. Flat Exotics Cores (0.625m, 1.25m, 2.5m): Look like batteries of their size. Kinetic Shunt (1.25m, 2.5m): Look like ISRUs. Kinetic Catapults (1.25m, 2.5m): Look like RA100 relay satelites. Energy shields (1.25m, 2.5m): Custom models! Produce a 10m and 15m shield around the part. First testing refinery using stock parts save for mechjeb and ES. 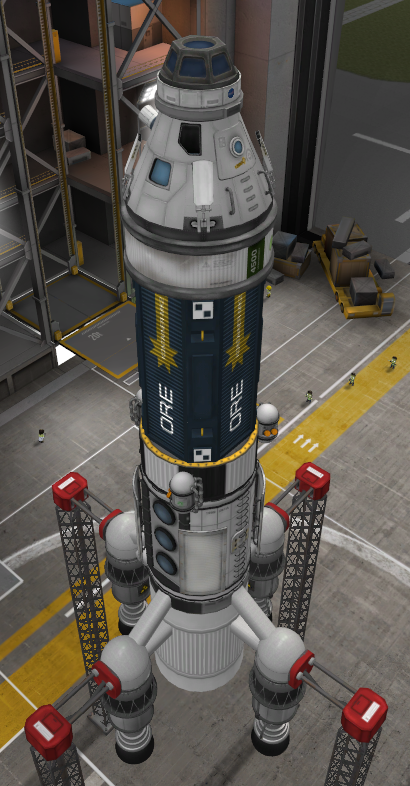 Designed to put a load of ore into orbit to be refined, then use an EVE drive to make it back to the ground. Basic refinery I launched with from the Mun with Extraplantary launch pads. 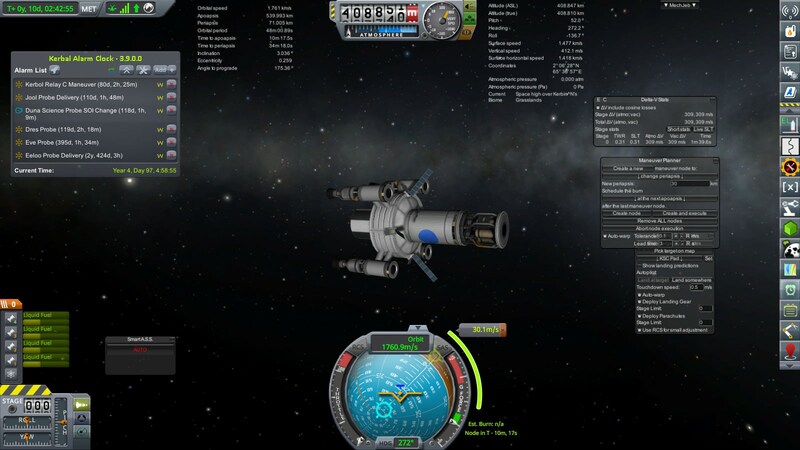 Able to make it to a low munar orbit in order to refine initial EM. Refinery utilizing Kinetic Shunt technology rather than traditional engines. 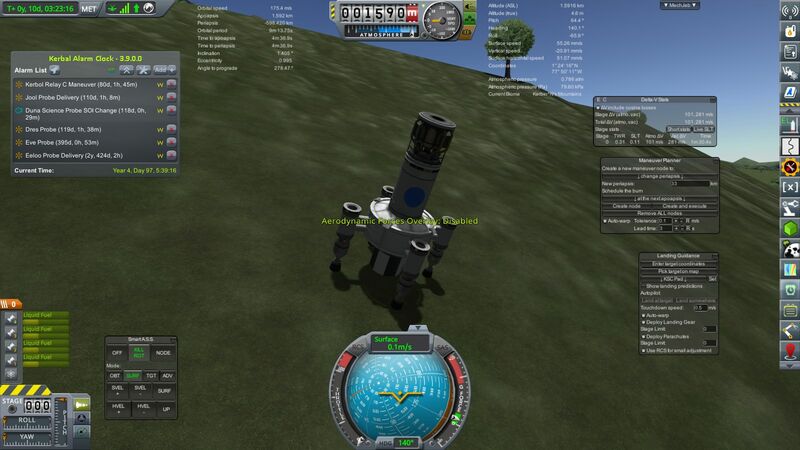 Munar resource return craft. 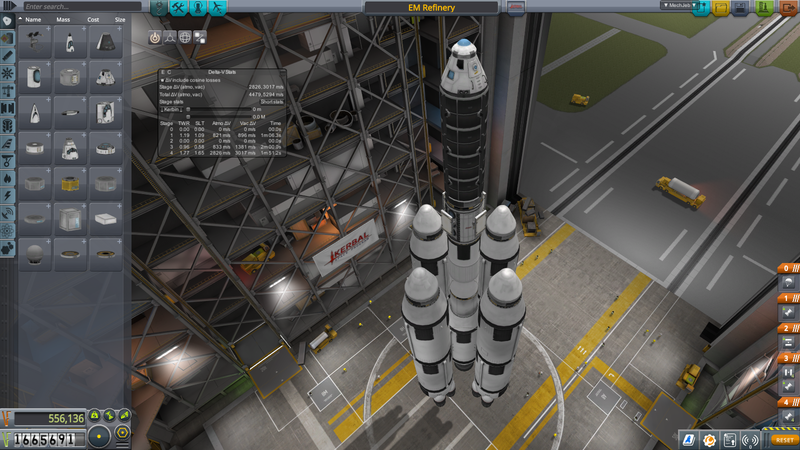 Designed to take a load of exotic minerals and a chunk of Exotic Matter from the mun to kerbin. This version actually had an issue with steep atmospheric descent. Once it gets down far enough, the amount of pressure on the shield is so high that it was ripping shield module off of the rest of the ship. I had to retry at a lower angle in order for the shield and exotic minerals container to not get ripped apart. Image2 looks to have a modified cupola command pod?? Above the mk1-3. I dig it. How and where can i find? hi... will this mod be updated for KSP 1.5.1?